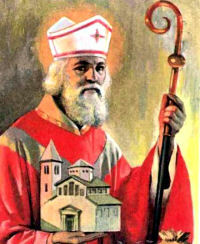 O God, who made the Bishop Saint Ambrose a teacher of the Catholic faith and a model of apostolic courage, raise up in your Church men after your own heart to govern her with courage and wisdom. Through our Lord Jesus Christ, your Son, who lives and reigns with you in the unity of the Holy Spirit, one God, for ever and ever. St. Ambrose (340-397) was born at Treves in Gaul, a territory which embraced modern France, Britain, Spain, and part of Africa. He studied in Rome and later became governor of Liguria and Aemelia with residence at Milan. While supervising the election of a new bishop of Milan in 374, he himself was suddenly acclaimed the bishop. He was only a catechumen at the time. He was ordained a priest and consecrated a bishop on Dec. 7. He wrote much on the Scriptures and Fathers, preached a homily every Sunday, resisted the interference of the secular powers with the rights of the Church, opposed the heretics, and was instrumental in bringing about the conversion of St. Augustine. He composed many hymns, promoted sacred chant, and took a great interest in the Liturgy. Around the year 333 Ambrose was born at Trier, the child of a noble Roman family. After his father's death he went to Rome, and was soon appointed consul with residence at Milan. While attempting to settle a dispute between the Arians and Catholics over the choice of a bishop, he himself was chosen, although only a catechumen at the time. Thereupon he devoted himself wholeheartedly to the study of theology, and gave his possessions to the poor. He was an illustrious preacher, and through his sermons brought Augustine to the faith and baptized him. Candid and fearless no matter how strong the opposition, Ambrose was directed to confront Maximus, the murderer of the Emperor Gratian. When Maximus refused to do penance, Ambrose excommunicated him. Later he denied Emperor Theodosius entrance into church for his massacre of the inhabitants of Thessalonica. It was on this occasion that allusion was made to [King] David as a murderer and adulterer, and Ambrose retorted: "You have followed him in sin, now follow him in repentance." Humbly, Theodosius accepted the penance imposed. We often meet this saint in the Divine Office as a teacher and as an inspired composer of hyms (fourteen of the hymns attributed to him are definitely authentic, true pearls of religious poetry). His writings are vibrant with ancient Christian liturgical spirit, for his life was wholly rooted in mystery and sacrament. We can profit greatly by reading Ambrose's works. He is one of the four great Latin Doctors of the Church. Patron: bee keepers; bees; candlemakers; chandlers; domestic animals; French Commissariat; learning; Milan, Italy; schoolchildren; students; wax melters; wax refiners. Symbols: Scourge; beehive; tower; dove; cope and mitre; human bones; scroll with staff of music; pen book and pen; cross; chalice; bull; knotted scourge; two scourges; goose; writing tablet and stylus; heart surmounted with flame; scroll with quotation from writings. Often Portrayed As: Bishop holding a church in his hand; beehive; man arguing with a pagan; with Saint Gregory the Great, Saint Jerome and Saint Augustine of Hippo. See Celebrating the Feast of St. Ambrose for ideas. Read some of the Writings of St. Ambrose, Doctor of the Church. Food Ideas: Besides the recipes named for Ambrose, other highlighted recipes are honey cakes or cookies, appropriate since Ambrose is known as the "Honey-Tongued Doctor."